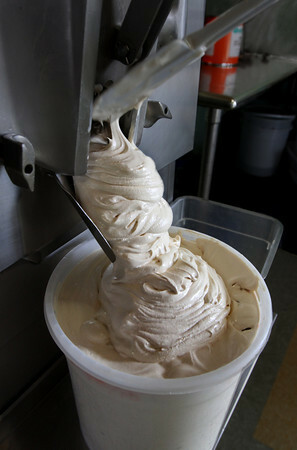 Although it may look like soft-serve ice cream, this is actually a fresh batch of scoop ice cream as it emerges from the mixing machine Tuesday at Down River Ice Cream in Essex. The owners of the shop, Joe and Amy Ahearn, stir the ice cream slowly to minimize the amount of air that is mixed in, making it more dense than typical mass-market American ice cream. This batch is a caramel ice cream the Ahearns call Salty "C", which has milk chocolate-covered pretzels stirred in.